Shortly after completing Alice in Wonderland Lewis Carrol (the name Charles Dodgson used for a pseudonym) began writing a sequel. This became Through the Looking Glass. 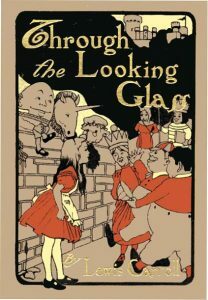 Again inspired by young Alice Liddell, Dodgson crafted another magical world of adventure and adversity for a young heroine who must find her own way amid a world which obeys no conventional logic. Filled with nonsensical characters and animals who are most often hostile, she negotiates a game of chess to find her way home. Where Alice in Wonderland seemed to be dominated by the metaphor of playing cards, the sequel is under the spell of the chess board. Integral to the plot is that Alice makes her way to the last square so she may become a queen. The story presents us with a young intelligent girl who is confronted with a world which does not understand the conventions of logic and reason. She is forced to adapt and improvise. She must also come to grips with characters who are singularly unfair. We can surmise that the lessons conveyed by the book are that the adult world often does not make sense and life is not fair. As a little girl of 7 years, she struggles with these facts. In the end, Alice finds a sympathetic character in the White Knight. Though dishevelled and unruly, he is kind to her while all of the other characters are outright rude. Scholars have conjectured that the White Knight is a double of Dodgson himself who may have seen himself as Alice Liddell’s knight. The novel seems to be preoccupied with language and the meanings of words. An entire discourse unfolds as Humpty Dumpty explains a nonsense poem to Alice. Yet, even his explanation is nonsense. The book enacts a general anxiety over the lack of fixed meaning for language.